Impeller with blades curved forward. 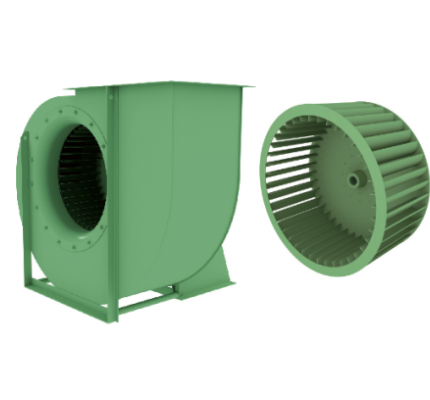 Use: the high output centrifugal fans of this series are suitable for the suction of clean or plants slightly dusty air in civil and industrial air conditioning. Suction: vitiated air, welding fumes, vapours from solvent tanks and spraying booths. Cooling: plastic materials, cloths, glass sheets. Drying: fodder, cereals, papers, varnishes, wood. Elimination: fumes and toxic gas. This series is also used where it is necessary to transport air with maximum temperature of 90°C with low pressure. For temperatures of the transported fluid higher than 90°C up to 350°C a small heat stopping fan is splined to the shaft between support and scroll; besides the fan is painted with a special aluminium paint suitable for high temperatures.